BriskHeat® Full-Coverage Drum Heaters are designed to wrap around a drum and heat the contents while insulating to keep the heat exactly where it needs to be. All-in-one drum heater solution with built-in insulation and a digital temperature controller to maximize heat efficiency and heat-up time. Combine the convenience of quick heat-up time and the precision of a digital controller to provide you with the most practical, efficient means of freeze protection, viscosity control, and maintenance of materials at elevated temperatures. Our full-Coverage Drum Heaters provide a safe and efficient method of temperature and viscosity control; an ideal 55 gallon drum heater. Includes Digital temperature controller to maximize heat efficiency and heat-up time. Most practical, efficient means of freeze protection, viscosity control, and maintenance of materials at elevated temperatures. NOTE: For increased thermal efficiency, add a BriskHeat drum cover reduce heat loss through the top surface of the drum. See drum heater accessories for more information. * 240VAC Celsius models have crimped wire ferrule terminated leads. NOTE: 55 gallon models can be expanded to fit up to 24.2" (615mm) diameter drums by using an expansion strip PN FGDHSTRIP. See Drum Heater Accessories for more information. Remove heater from box. Make visual inspection of drum heater. Do not use if torn or damaged. Drum heater should be placed on a clean, dry surface. Open hook and loop closure on heater and position around drum with adjustable thermo-switch in the upper third of the heater. Heater should be positioned on drum such that it is covering the drum from the floor to the top of the drum. Fasten hook and loop closure so heater is tight against the drum with no sagging or bundling. Cover top of drum with optional insulation cover (sold separately, PN: FGDC55). For larger diameter drums, up to 24.2” (615mm), optional Insulated expansion strips are available (sold separately, PN: FGDHSTRIP). For 120VAC model, plug standard 3-prong plug to appropriate electrical power supply. For 230VAC model, terminate power cord to appropriate electrical power supply. The power cable consists of three color-coded conductors, black, white, and green. The black wire should be connected to Line 1. The white wire should be connected to Line 2. The green wire should be connected to earth ground. The power connections must be adequately rated to electrically support the voltage and amperage of the heater. The identification label located on the power cord displays voltage and amperage requirements. Follow all local electrical codes for proper electrical connections. Adjust controller to desired setting (See page 6 for programming instructions). Drum heaters designed for metal drums (FGDH series) can be adjusted 50-450ºF (10-232ºC). Drum heaters designed for plastic drums (FGPDH series) can be adjusted 50-160ºF (10-71ºC). Does not heat Verify heater is connected to proper voltage. The identification label located on the power cord displays the heater’s voltage requirement. Check to see if there is a resistance reading (not an open circuit) in heater using an ohm meter. Circuit breaker is tripping Validate that the circuit breaker is capable of handling the amp requirement of heater. The identification label located on the power cord displays the heater’s amperage requirement. Examine heater and cord for any damage. Something has lightly spilled on exterior or interior To remove spillage from heater surface use any typical household cleaner, that does not contain any silicone rubber dissolving type ingredients, with a clean cloth. 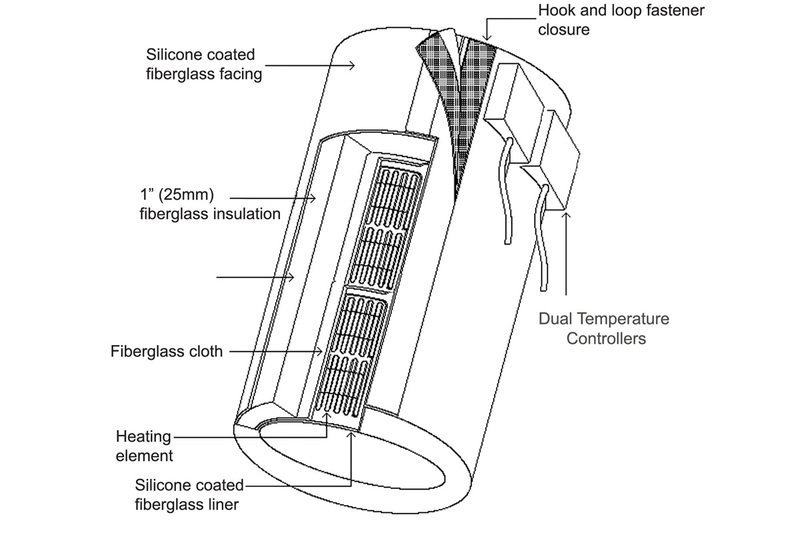 For complete instructions, please review the Full-Coverage Drum Heaters (FGDH/FGPDH/FGDDC) manual.